For those of you with lots of electronics that need powering up or plugging in--this wou;d seem perfect for you! 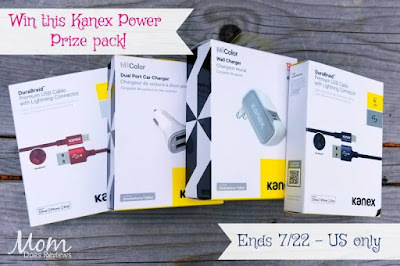 I know I could certainly use that car charger--Read all about it in Pam's review (link below)-then get in there and enter! 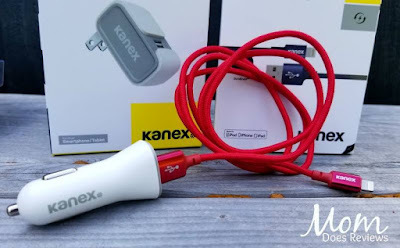 At Kanex, we believe creativity is more than a vocation. It’s a calling to craft something out of nothing, innovate solutions, and make stunning things. That’s what inspires us to design innovative electronic solutions that help keep you curious and prolific. Driven by passion. Curious by nature. Unconventional by design. The premium anodized aluminum housing on each unit reduces tangles, increases durability, and offers a unique premium look and feel to the daily charge-and-sync routine. The Kanex Power Prize package includes two new Premium DuraBraid Lightning Cables, available in Red and Blue, along with a White 2.4A USB Wall Charger and Dual Port USB Car Charger. My iPhone is always dead. I'm forever charging my cell ohone! My phone is the device I have to charge most often. I have to charge my iPhone the most! It's insane how crappy my battery is! I really could use this type of prize! Thanks for the chance to win! My Kindle! I read so much that I have to charge it every day. I am constantly charging my laptop!!! Undoubtedly, I am charging my laptop the most. It would always be the phone! My iPad is always needing a charge! Kindle fire, my kid watches show constantly! I am always running out of charge and on empty with my cell phone because of using the internet.